The Black Prince's Ruby is a large, irregular cabochon red spinel weighing 170 carats (34 g) set in the cross pattée above the Cullinan II diamond at the front of the Imperial State Crown of England. The spinel is one of the oldest parts of the Crown Jewels of the United Kingdom, with a history dating back to the middle of the 14th century. It has been in the possession of England's rulers since it was given in 1367 to its namesake, Edward of Woodstock (the "Black Prince"). All red gemstones used to be referred to as rubies or "balas rubies". It wasn't until 1783 that spinels were chemically differentiated from rubies. A red spinel is a compound of magnesia, iron, oxygen, and chromium, while a ruby is a type of aluminium oxide. The rarity of this spinel, however, is that it is the biggest uncut spinel in the world, given that it has only been polished slightly, and has never received a proper cut, gemologically speaking. The Black Prince's Ruby enters the "stage of history" in middle of the 14th century as the possession of Abū Sa'īd, the Arab Muslim Prince of Granada. At that time, the rule of Castile was being centralized to Seville and the Moorish Kingdom of Granada was being systematically attacked and reverted to Castilian rule as a part of the Christian Reconquest of the Iberian peninsula. Abū Sa'īd in particular was confronted by the belligerency of nascent Castile under the rule of Peter of Castile, also known to history as Don Pedro the Cruel. According to historical accounts, Abū Sa'īd wished to surrender to Don Pedro, but the conditions he offered were unclear. What is clear is that Don Pedro welcomed his coming to Seville. It is recorded that he greatly desired Abū Sa'īd's wealth. When Abū Sa'īd met with Don Pedro, the King had Abū Sa'īd's servants killed and may have personally stabbed Sa'īd to death himself. When Sa'īd's corpse was searched, the spinel was found and added to Don Pedro's possessions. In 1366, Don Pedro's illegitimate brother, Henry of Trastámara, led a revolt against Don Pedro. Lacking the power to put down the revolt unaided, Don Pedro made an alliance with the Black Prince, the son of Edward III of England. The revolt was successfully put down and the Black Prince demanded the ruby in exchange for the services he had rendered. While historians speculate that this was contrary to Don Pedro's desires, he had just suffered a costly civil war and was in no position to decline. It can be assumed that the Black Prince took the Ruby back to England, although it is absent from historical records until 1415. During his campaign in France, Henry V of England wore a gem-encrusted helmet that included the Black Prince's Ruby. In the Battle of Agincourt on October 25, 1415, the French Duke of Alençon struck Henry on the head with a battleaxe, and Henry nearly lost the helmet, along with his life. The battle was won by Henry's forces and the Black Prince's Ruby was saved. Richard III is supposed to have worn the gemstone in his helmet at the Battle of Bosworth, where he died. Henry VIII's inventory of 1521 mentions "a great balas ruby" set in the Tudor Crown, thought to be the Black Prince's Ruby. It remained there until the time of Oliver Cromwell in the 17th century. With the exception of the Coronation Chair and several other items, Cromwell had the principal symbols of the king's power – the Crown Jewels – disassembled and sold, and the gold was melted down and made into coins. What happened to the Black Prince's Ruby, then valued at £4 (equivalent to £524 as of 2018), during the Commonwealth of England is not clear, but it came back into the possession of Charles II when the monarchy was restored in 1660. 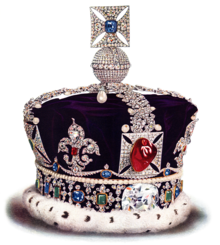 At the coronation of Queen Victoria in 1838, she was crowned with a new Imperial State Crown made for her by Rundell and Bridge, with 3,093 gems, including the spinel at the front. This was remade in 1937 into the current, lighter, crown. A plaquette on the reverse of the gemstone commemorates the crown's history. ^ a b "The Imperial State Crown". Royal Collection Trust. Inventory no. 31701. ^ Sir Thomas Butler (1989). The Crown Jewels and Coronation Ceremony. Pitkin. p. 6. ISBN 978-0-85372-467-4. ^ "Spinel". Gemological Institute of America. Retrieved 16 December 2015. ^ Elie L. Ménasché (1954). Ceylon: Island of Gems. New Delhi: Asian Educational Services. p. 18. ISBN 978-81-206-1932-6. ^ The Jewelers' Circular. 99. Jewelers' Circular Company. 1930. p. 121. ^ John Plowfeld (1521). "King Henry VIII's Jewel Book". In Edward Trollope (ed.). Associated Architectural Societies Reports and Papers. 17. James Williamson. p. 158. ^ Jennifer Loach; G. W. Bernard; Penry Williams (1999). Edward VI. Yale University Press. p. 36. ISBN 978-0-300-07992-0. ^ George Herbert Smith (1962). Gemstones. Pitman. p. 247.